Points Hardened for accurate work. We offer our client an excellent quality range of Steel Scriber, which are manufactured from high grade quality raw materials. These scribers can be customized as per our precious customers specifications. · Available in auto black as well as chrome finish. · High quality steel makethese long lasting and non corrosive. · Durable, efficient and sturdy. 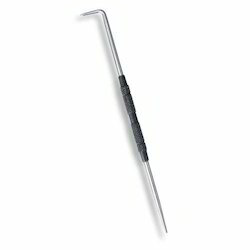 This Straight End Scriber made of chrome vanadium steel with knurled handle. Diameter 8mm. Replaceable points individually packed. Our organization is highly applauded in offering Machinist Scriber to our clients. It has fixed and straight bent point and finds application in metalworking application. The process of using scriber in this is called as scribing. This product is reliable and efficient. Experts have used latest technology for its production. Our organization has gained the leading position by trading the best range of Engineers Scriber. We offer our client an excellent quality range of Engineer Scriber & Marker, which are manufactured from high grade quality raw materials. These Engineer's Scriber and Marker can be customized as per our precious customers specifications. These Engineer's Scriber and Marker are widely known for its durability and quality. - For use by machinists, engravers, mechanics etc. 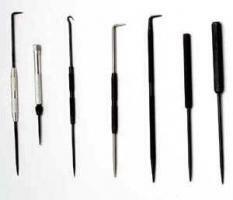 To meet the various requirements of the customers, we are involved in offering a wide assortment of Recess Scriber. This scriber made of chrome vanadium steel with knurled handle. Diameter 8 mm. Replaceable points individually packed.